This article appeared in Sacred Web 9. 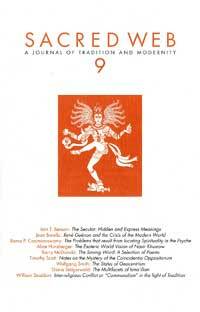 To order this issue of Sacred Web and other back issues, click here. Most likely his family was of Shi'i persuasion, possibly even Ismaili.3 Unsatisfied with most of the religious teachings of his day, he tells us he studied broadly in an attempt to find a belief system that would provide answers to the questions of the meaning of life and the existence of the entire creation. His conversion, or 'rebirth', to the Ismaili faith led him to deeper study and his subsequent writing of a great number of theological and religious texts about the beliefs of Ismailism. The impetus for Nasir Khusraw's composition of the Jami' al-Hikmatain arose from a series of questions posed in a long poem by the Ismaili poet-philosopher Abu'l-Haitham which had come to the attention of the prince of Badakhshan, 'Ali ibn Asad. The prince requested Nasir Khusraw to write a commentary on the poem. Abu'l-Haitham's poem refers to, alludes to, and directly questions various religious beliefs and practices. The methodology Nasir Khusraw chooses to employ in Jami' al-Hikmatain is first to quote directly the verses he is commenting on, then to summarize what the "philosophers" say (including Plato and Aristotle and the philosophers of his own day), then to describe the opinion of the "People of ta'wil" (or, variously, hukama-ye din-e haqq, literally, the sages of the Religion of Truth), that is, the people who practice esoteric hermeneutics. Following the accepted practice of his day, Nasir Khusraw rarely cites particular thinkers but, instead, gives a summary of the general position of either the "philosophers" or the "esotericists". If we look closely at a number of Nasir Khusraw's responses we can witness his intellectual approach to spiritual matters, particularly how he views various levels of connection between the physical world and the spiritual world. In order to comment on the verse quoted above, Nasir Khusraw first presents the position of the leading philosophers, who liken the seven revolving planets (sitarah) to windows which let in light from the upper realm. "The philosopher sages say" that all light and subtlety which has reached the elements in this world came from the upper realm through these seven planets, which act like windows from that world to this. However, while light and subtlety arrive from that world in a single manner, the sources of light (the planets) differ in their natures. Moreover, those who would receive the light down here below differ even more, both in their natures and in their positions on the earth, and therefore have received differing amounts of spiritual light and subtlety. It is this difference in receptivity, therefore, that accounts for the great differences in minerals, plants and animals in the physical world. In contrast to the philosophers, the People of Conviction (Ahl-e Tayid), however, see a more direct "effect" (athar) between the hierarchies of the macrocosmos and the microcosmos. They say that all that exists in the sensible world is an "effect" of all that which exists in the upper world. (See Chart I.) Things on earth draw their light and subtlety from seven planets, and these planets "are proof" that in the numinous realm are Seven Primordial Lights, primordial and pre-eternal, which are the source of all light in material bodies. The seven planets of the corporeal world also have seven effects, namely the seven levels within each human being. Then, following the philosophers but not saying so, Nasir Khusraw explains that each human being has his or her own measure of receptivity. That is, each soul differs in its ability to receive and accept the influx of the seven primordial substances (i.e., the Primordial Lights). In the same way, each of the seven essences or elements (i.e., the metals) can receive, in its particular measure, the influx of the seven planets. (Chart 1, Columns 1 and 3, and Columns 2 and 5.) Thus, "according to the measure of the substance in its soul" each human being can receive light and subtlety from the Primordial Lights, and "according to the measure of the substance in its soul" each metal can receive light and subtlety from the seven planets. Accordingly, one soul resides at the level of Prophethood and one element at the level of gold; not all human beings can be prophets and not all elements can be gold. This has particular import in the hierarchy of the Ismaili outreach structure (da'wa). Within Universal Intellect, which Nasir Khusraw terms "the king of the upper world," there is a ranking for each member of the Ismaili community. This ranking derives from a sharing, a participation in the nature of the Prophet himself. The Prophet, who is "noble to the extreme for [partly because] he has received the totality of the Light." This sharing or "communion" in or with the nature of the Prophet means that each Ismaili believer, to the degree he or she is able, participates in the grace of the Prophet. Nasir Khusraw quotes a hadith of the Prophet: "Ali is a part of me as I am a part of him." Therefore, just as, for example, all metals partake, to the measure of their own receptivity, of the light from the seven planets, so all Ismaili believers partake, to the measure of their own receptivity, of the light from the Prophet. However, Nasir Khusraw appears to ignore the hierarchical implications and concentrates instead on the chronological in his concluding statement that just as in the astronomical heavens seven planets shine, so too in the esoteric heavens do Seven Lights shine. 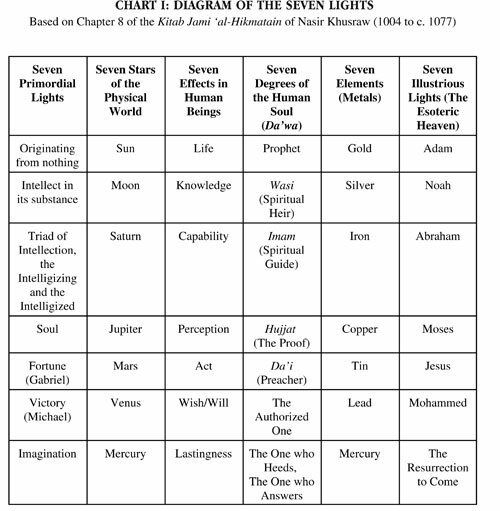 These Seven Lights in the esoteric heaven signify the series of seven Prophets who have come, as well as the one who will come at the end of time. Are they walled inside a fortress strong? Lines 64 and 65 of the poem provide Nasir Khusraw another opportunity to show the correspondence between the spiritual and physical realms and between the heavenly and the earthly worlds, and ultimately their relation to the world of religion. He states that the poem asks why the Sun has been placed in Leo and the Moon in Cancer, and why the Sun and Moon each has only one astrological house while the five other planets each has two? He says that the answer to one question is also the answer to the other, and then takes up the first question first. The influence of the Sun and the Moon on the earth, he explains, is greater than that of the other five planets - the Sun because it is bigger and the Moon because it is closer. In addition, the two have a special rapport with each other so that when one is gone the other appears, the Moon acting as a vizier to the caliphal Sun. Basically, what house each one is in couldn't be otherwise, he points out, because Cancer is a sign of water and the Moon is a star of water, while Leo is a sign of fire and the Sun a star of fire; it would be impossible to have them reversed. Nor could the astronomers have placed them in other houses. The twelve signs of the zodiac are evenly spaced across the sphere, six in the hemisphere of the Sun and six in the hemisphere of the Moon, with six on one side facing six on the other side. 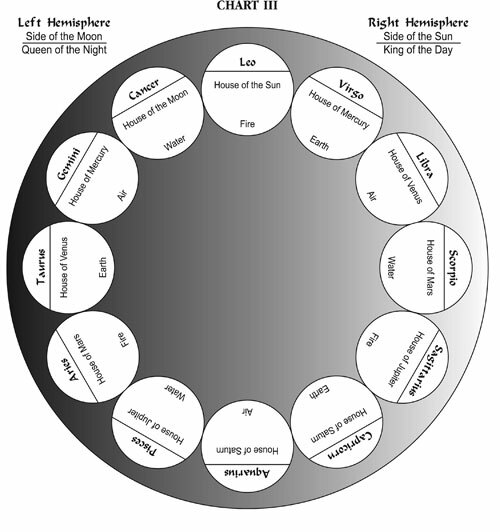 The Sun and the Moon could not be placed in other houses even in their own hemispheres, for example to Aries and Pisces, he argues, for those are the beginning and ends of the series of houses, rather than the highest houses in relation to the North Star (JH 276). Now Nasir Khusraw introduces a topic he will expand upon in the next section, the notion that the whole cosmos can be likened to a body, in which the flaming ball of the Sun is the spirit (ruh) which animates it. All the movements that happen when the sun shows its face - the blossoming of the buds, fresh growth on the mountains and plains, the splendor with which fruits and trees bedeck themselves, the rousing of animals from their sleep - all these, declares Nasir Khusraw, "bear witness to the veracity of my statement that 'the Sun is the spirit of this world' (JH 275)." In his answer to the second question, Nasir Khusraw builds on the first. Having explained how the Sun and Moon have greater influence, he says they are therefore like lords (sultans) and the other five planets like servants to help accomplish the main goal, which is creation. The seven planets are like tools of the Universal Soul, which also has the assistance of the Universal Intellect, in fashioning (sakhtan) the multiplicity of individuals in the world. The ultimate aim of this creation (san') is the form of individual man (surat-e shakhs-e mardom). With the help of these tools, the Universal Soul delineates the form of man, the apogee of creation, the finest and most perfect form, capable of receiving knowledge and wisdom ('ilm wa hikmat) (JH 279-281). So that the favor (the strength, the blessings) (ihsan, p. 280) will come equally to each planet from the Sun and the Moon, each 'servant' has one house with the 'king' and one house with the 'queen'. That is, each of the five planets has a house with both the Sun and the Moon; together these total ten houses, plus one each for the Sun and the Moon, totals the twelve houses of the Zodiac. The five planets of the macrocosmos function at the level of the five senses of Earthly Man. But here we have a problem in interpreting Nasir Khusraw's writing. Twice (JH 282,284) he lists the planets in descending order (Saturn, Jupiter, Mars, Venus, Mercury) followed by the senses listed in descending order of importance (sight, hearing, smell, taste, and touch). But twice he seems to contradict this hierarchical correspondence: once in the narrative (p. 286) and in the diagram (p. 287). We can see his problem in both schemata. In the first instance, he wants to follow a hierarchy of importance for both the planets (using size/distance) and the senses (sight is always most important for Nasir Khusraw). In the second, he is bound by the diagram of relative positions of the twelve zodiacal houses. Let us refer to that diagram. At the top, we have the two houses of the Moon (on the left) and the Sun (on the right). Closest on both sides are the two houses of Mercury (Gemini (left), Virgo (right)); then the two houses of Venus (Taurus left, Libra right); then the two houses of Mars (Aries left, Scorpio right); then next to the bottom the two houses of Jupiter (Pisces left, Sagittarius right), and at the bottom the two houses of Saturn (Aquarius left, Capricorn right). 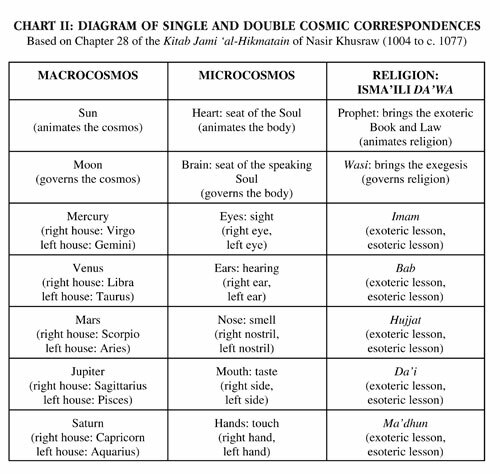 For Nasir Khusraw, just as each of the five 'attending' planets has two houses, the five senses each has two tools. For example, we have two eyes but our sight is one; two ears, but hearing is one; two nostrils, but smell is one; two sides of the mouth, but taste is one; and two hands, but the sense of touch is one. The lesson here is that just as God created the structure of the human body on the model of the world, so too did the Prophet establish the Religion of Truth on the model of the creation of man. By so doing, the Sages of Religion would know that the Prophet established the Religion on the order of the Creator and that, for example, the six days of material world are also reflected in the world of religion. Thus in the sacred cosmos, the Prophet holds the place of the Sun, for it is he who animates the world of Religion. The Wasi (the spiritual heir of the Prophet) holds the place of the Moon, for the Wasi establishes order and harmony in the world of religion, indeed, he is the soul of the mystic body of religion. In the mystic body of the Religion of Truth, the Prophet holds the place of the heart, for it is the heart which gives life to the body and it is the Prophet who gives life to the world of religion, while the Wasi holds the place of the brain, for the brain governs this body and the Wasi governs the world of religion. Each member of this pair governing the world of religion is singular and has one abode, mirroring the astronomical and human models. Just as each of the five planets has two houses, so too in the world of religion does each of the five 'servants' to the Prophet and Wasi have two abodes within which to work. The Prophet brought the exoteric Book and Law; the Wasi brings the exegesis of the Book and the Law. The five servants in the world of religion, the Imam, Bab, Hujjat, Da'i, and Ma'dhun9 each are responsible for both the exoteric and the esoteric 'houses' of their level in the Ismaili convocation (da`wa). It is altogether too tempting and too easy to see the correspondences drawn here as mere allegory, that 'this' stands for 'that'. This would be wrong. For Nasir Khusraw and the other Ismailis too, these correspondences were the very foundation of all being, the inner workings of the entire cosmos (in all its possible levels), the theoretical and visionary structures coursing through every aspect of being: ontological, spiritual, intellectual, religious, physical, social, human, animal, plant, mineral. In this way, sacred purpose is spread through every thing and every act. Indeed, with this vision, nothing was left untouched by the sacred. 1 Nasir-i Khusraw’s Book of Travels (Safarnama): A Parallel Persian-English Text, edited and translated by Wheeler M. Thackston, Jr. (Costa Mesa, California, Mazda Publishers, 2001). 2 See Alice C. Hunsberger, Nasir Khusraw, The Ruby of Badakhshan: A Portrait of the Persian Poet, Traveller and Philosopher (London: I.B. Tauris Publishers, 2000), 10-16, where Nasir Khusraw’s writings are summarized. For information on unpublished manuscripts, see Ismail K. Poonawala, Biobibliography of Isma’ili Literature (Malibu, California, 1977), 123-5. 3 Henri Corbin and Mohammad Mo’in, editors, Kitab-e Jami’ al-Hikmatain: Le Livre Reunissant les Deux Sagesses (Tehran and Paris, 1984  ), which contains an extensive Etude Preliminaire, with a discussion on this particular topic, page 28. 4 Heinz Halm, The Fatimids and their Traditions of Learning (London: I.B. Tauris, 1997). 5 For a detailed review of the philosophical context on Ismaili philosophy, see Paul E. Walker, Early Philosophical Shiism: The Ismaili Neoplatonism of Abu Ya’qub al-Sijistani (Cambridge, Cambridge University Press, 1993), 3-63. For a broad sampling of the Greek texts available to early scholars of Islam, see Franz Rosenthal, The Classical Heritage in Islam, translated from the German by Emile and Jenny Marmorstein (Berkeley and Los Angeles, California, University of California Press, 1975  ), 75-161. 7 This section is based on chapter twenty-eight of Jami’ al-Hikmatain, pp. 274-292. 8 Insan-i kabir (Cosmic Man) is, of course, different from the concept of Insan-i kamil (Perfect Man), which also has an extensive tradition in Islamic mysticism. Ibn ‘Arabi may have been the first to use the phrase Insan-i kamil in his Fusus alhikam, chapter 1, and ‘Abd al-Karim al-Jili (d.820/1417) has a treatise entitled, al-Insan al-kamil fi ma’rifat al-awakhir was’l-awa’il, explaining the concept in detail. See Encyclopaedia of Islam (“al-Insan al-Kamil); Henry Corbin, Creative Imagination in the Sufism of Ibn ‘Arabi (Princeton, New Jersey, Princeton University Press, 1969), 131-133,211, 317. Compare with the Adam kadmon, in the Lurianic writings of Jewish mysticism, a doctrine that the first being which emanated from divine light was “primordial man”. See Gershom G. Scholem, Major Trends in Jewish Mysticism ( New York, Schocken Books, 1974  ), 265,269. 9 Although this listing differs by one from the list in chapter 8, the basic argument still pertains.